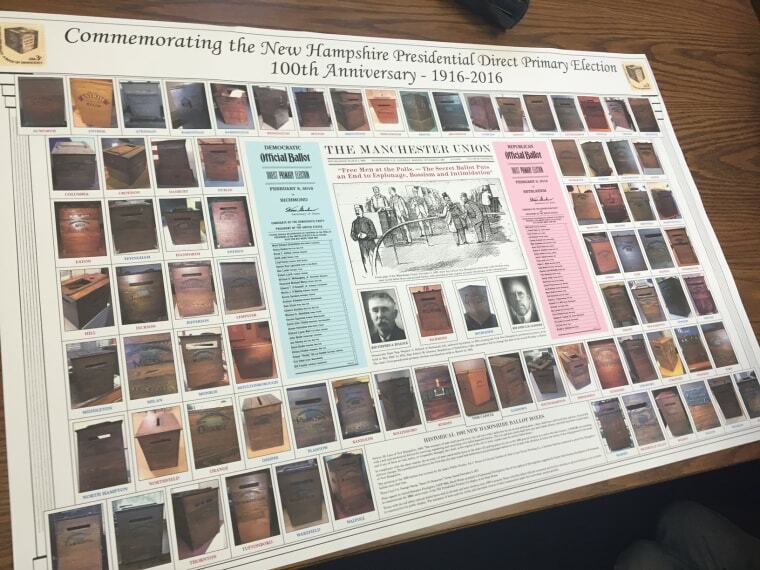 NBC's Kailani Koenig reports on the New Hampshire primary date being set yesterday, officially locking in the 2016 calendar. CLINTON: The New York Times previews Saturday's Democratic debate. A new Washington Post/ABC poll shows Clinton still leading Sanders 2-to-1 with a huge advantage on handling terror -- but trailing on trust. HUCKABEE: Uh-oh. From POLITICO: "Former Arkansas Gov. Mike Huckabee's presidential campaign, struggling with its low standing in the polls and underwhelming fundraising, slashed the salaries of senior staffers amid the departure of its top communications aide." RUBIO: The New York Times writes the story on Rubio that many folks have been thinking: "Mr. Rubio’s all-things-to-all-people strategy is stretching his campaign thin, posing challenges in focusing his message and raising doubts among his supporters about his seriousness." SANDERS: A big story overnight first broken by the Washington Post: "Officials with the Democratic National Committee have accused the presidential campaign of Sen. Bernie Sanders of improperly accessing confidential voter information gathered by the rival campaign of Hillary Clinton, according to several party officials. Jeff Weaver, the Vermont senator’s campaign manager, acknowledged that a low-level staffer had viewed the information but blamed a software vendor hired by the DNC for a glitch that allowed access. Weaver said one Sanders staffer was fired over the incident." He's now received two million campaign contributions. TRUMP: Asked if he'd label himself a loser if he doesn't win the GOP nod, he said ""In a certain way, yeah. Hate to say it. If I lost the nomination, yeah, I guess I'd call myself a loser." His backers are trying to oust the chair of the GOP in New Hampshire. Former aide Roger Stone is starting a super PAC to attack Trump's rivals, including Marco Rubio. OBAMA AGENDA: Year-end news conference! The president holds a year-end press conference at 1:50pm ET. Why no ground troops? The New York Times: "In a private session at the White House, Mr. Obama explained that his refusal to redeploy large numbers of troops to the region was rooted in the grim assumption that the casualties and costs would rival the worst of the Iraq war. In such a scenario, he said, a renewed commitment could take up to $10 billion a month and leave as many as 500 troops wounded every month in addition to those killed, a toll he deemed not commensurate to the threat." From the Washington Post: "President Obama’s biggest battles over the past year were ones he had carefully selected with an eye to securing his presidential legacy — diplomatic deals with Iran and Cuba, an international deal on climate change and executive actions on immigration and paid sick leave. But as he moves into the final year of his presidency, Obama faces a series of challenging issues not of his choosing, ones largely foisted upon him by the unruly reality of the world at home and abroad — terror attacks, mass shootings and chaos in the Middle East." The New York Times offers a long piece on efforts to suppress the Latino vote. The Wall Street Journal: "House Democrats decided to make Speaker Paul Ryan (R., Wis.) sweat this week over the outcome of Friday’s vote on sweeping spending legislation to fund the government through next September. Aware that Republican leaders will need their votes to pass the $1.15 trillion bill, many House Democrats on Thursday broadcast their objections to the legislation, which would prevent a funding lapse when the government runs out of money at 12:01 a.m. on Dec. 23." The Washington Post writes that the spending bill is a win for Ryan, but his real test will be next year. *** Friday’s “Andrea Mitchell Reports” line-up: Joining NBC’s Andrea Mitchell at 12p ET – NBC’s Chuck Todd looking ahead to the President’s year-end news conference, Rep. Barbara Lee (D-CA) on the first anniversary of the U.S. opening diplomatic relations with Cuba, NBC’s Pete Williams on the latest in the San Bernardino terror investigation, plus more 2016 politics with the Washington Post’s Jonathan Capehart and Ruth Marcus, Fmr. Gov. Ed Rendell (D-PA), Republican strategist John Feehery, and NBC’s Kristen Welker.